In April 2014, the Landmarks Preservation Commission approved a plan for construction of an eight-story hotel next to the 1832 Merchant’s House, a federal, state, and city landmark. In New York City, it was the first building in Manhattan designated in 1965 under the new landmarks law. Today, it is one of only 117 buildings (and one of only six residences) that are both an exterior and an interior landmark. Remarkably, landmark status doesn’t guarantee adequate protection during adjacent building construction. Our fragile 185-year-old landmark House will be damaged during construction — possibly irreparably. 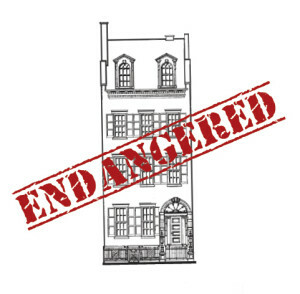 According to studies performed by structural engineers, if our building shifts a mere ¼ inch – as anticipated by the developers, and the maximum allowed by law – our original and irreplaceable 1832 ornamental plaster work, considered the finest extant in New York City and a national treasure, will suffer damage. “The integrity of the historic original plaster finishes is highly at risk.” If the settlement is more than ¼ inch, as some engineers have predicted, our structural integrity could be compromised. the planned eight-story hotel. If granted, it would allow them to go ahead with the project. We will do everything we can to defeat the developers’ application and have hired land-use, zoning, and preservation lawyer Michael Hiller (who, among other victories, blocked the plan to remove the Carnegie Steel book-stacks and millions of volumes of research materials from the NYPL and halted the MMA’s plan to expand further into Central Park). We have had to spend tens of thousands of dollars already on engineering consulting work and studies. Lawyers’ fees and engineering expenses are well over $50,000 and will continue to mount. We can’t protect the Merchant’s House without your help! Please consider a donation. Any amount will make a difference.